Lorraine Cobcroft is now happily retired and writing fiction and creative non-fiction, after a diverse career that focused mainly on technical and business writing. Lorraine has lived a full life, filled with challenges that drove a strong social conscience and a passion for writing stories that '''nudge the world a little'', exposing injustices and hopefully inspiring a desire to lobby for beneficial social change. Lorraine likes to help readers walk a mile in the shoes of her characters and feel their emotions, share their struggles and heartaches, and celebrate their victories. ''Mortgaged Goods'' was inspired by her own and her daughter's struggles parenting a ''special child'' and her own experience as an investor-victim of legal and political corruption. Lorraine also wrote ''The Pencil Case'', a minimally fictionalized account of her husband's life that exposes how he was stolen from his family and kept apart from them for 18 years. A mother and grandmother, Lorraine lives with her husband of 45 years - the love of her life - in beautiful Pottsville,NSW, Australia where she enjoys reading, gardening, sewing, spoiling grandchildren, singing in a choir, and beach walks. She and her husband also love travel and frequently take caravanning trips in the Australian Outback. 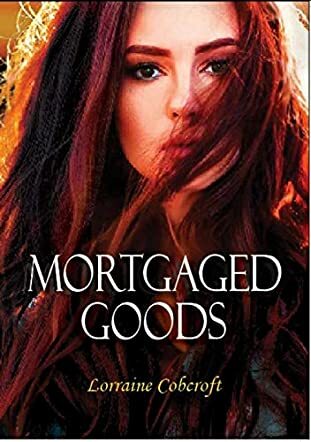 In a great new read by author Lorraine Cobcroft, Mortgaged Goods is a story that will grab readers from the very first words and won't let go until the very last. Following protagonist Natalie Dreyer, a beautiful and gifted corporate attorney, the story takes so many twists and turns that one simply cannot predict what will happen next. Natalie and the handsome and charming Karl Albrecht seem to have a life that any would envy, that is, until tragedy strikes and difficult things from her past cause major issues for the couple. Karl and Natalie's lives certainly will intrigue and surprise author Lorraine Cobcroft's readers to no end. I so enjoyed Mortgaged Goods. I started this book, intending to read just a few chapters one evening. Well, hours later and much, much later than I intended to be awake, I found myself finishing the very last pages, tired but satisfied! Author Lorraine Cobcroft has done a great job in creating characters that her readers will connect with, relate to, and continue to think about long after the book is done. If that isn't a hallmark of a great author, I don't know what is. Mortgaged Goods is exciting, full of surprises, and just a fantastic read! Any reader who loves an intriguing piece of contemporary women's fiction should absolutely pick up this book. I recommend this book highly and am very much looking forward to reading more from the very talented author Lorraine Cobcroft as soon as I possibly can! Mortgaged Goods was a book waiting to be written. To be written by a woman. A woman with knowledge and wisdom, compassion and sensitivity. Lorraine Cobcroft is such a woman. She has legal knowledge and experience as a mother to be able to handle the sticky issues of difficult births, child abuse, adoption, the ins and outs of the legal labyrinth. In this book Lorraine has crafted an account of the life of an intelligent, highly educated woman, who should have had the right to follow her ambition of becoming a great lawyer. But Natalie finds herself pregnant. Pregnant to a husband who would have her abort the baby, rather than sacrifice his own advancement. His beautiful wife would be an important rung in his ladder to the top. One issue, often overlooked in an adoption case is the plight of the natural mother. What drives a mother to give her child into the hands of a stranger? Lorraine has looked into Nata’s natural mother’s heart. With great sensitivity, she lets the reader know that sometimes this is the best solution. And, if all parties concerned are acting honourably, their lives will be enriched.